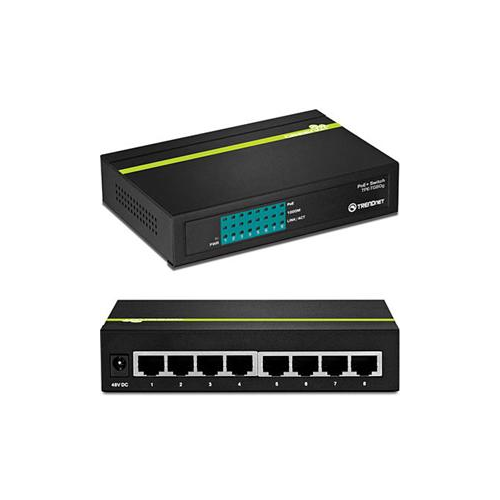 TRENDnet’s 8-Port Gigabit GREENnet PoE+ Switch, model TPE-TG80g, reduces equipment and installation costs by delivering data and power over existing Ethernet cables. 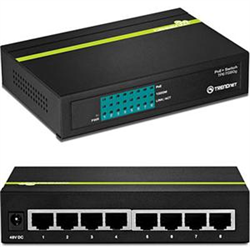 This unmanaged switch offers eight Gigabit PoE+ ports which supply up to 30 watts of power per port for devices such as high power wireless access points, PTZ (Pan / Tilt / Zoom) internet cameras, and VoIP telephony systems. Auto sensing technology delivers 30 watts to 802.3at PoE+ devices (up to 3 devices), 15 watts to 802.3af PoE devices, and only data to non-PoE devices. GREENnet technology reduces energy consumption by up to 75% when the switch is not in use. Boost office efficiency and reduce network congestion with a total switching capacity of 16 Gbps. LED indicators display device status for efficient troubleshooting. This switch comes in a sturdy metal case and quickly adds PoE+, PoE, and non-PoE devices to your network.